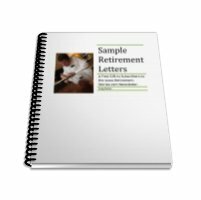 Retirement letters are a wonderful way to capture your sentiments as you look ahead to the retirement transition. I feel that a letter is an appropriate way to give a sense of closure and transition to important work-based relationships. When I work with clients in my Retirement Coaching practice, I always encourage them to take this essential step. So ... the dinners are over, the retirement gifts have been received and the day has arrived to write those letters? Here are some sample letters that I used for my own retirement. The strangest thing's happened ... its time to go! leaving ABC Company at the end of January, after x happy and productive years. I want to express my sincere gratitude for the excellent support that you and your colleagues have offered ABC over the years, and for the friendship we have shared. Your company has been part of our Brands development, and my own learning. The success of ABC is derived from many sources and the efforts of many people over a very long time. In modern times, Marketing Services, like yours, have played an important role in the Brands development. Regards to the team (past and present)... and others, I will miss them all. Most of all I will miss our conversations which were occasionally creative, philosophical and stimulating; sometimes rambling, and always entertaining. I wish you well in your business and personal life and hope we meet again some day, in business or socially. And so the time has come ... leaving ABC Company at the end of January, after x happy and productive years. I want to express my gratitude for the excellent support that you, your colleagues and predecessors in ... have offered ABC over the years. I can truly say that you have been part of the Companys development, and my own learning. We had some interesting negotiations. You were always professional and reasonable, and it was never personal. I shall miss those battles! Want to read more about retirement letters? And .... if you want to read other Sample Letters, see our great free gift below! Read what other people are doing for an Active Retirement. Subscribe to my monthly email newsletter, Retirement Stories. Full of new stories and tips on planning for and enjoying an active retirement.